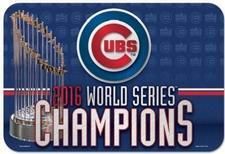 MLB World Series 2016 Chicago Cubs 20" x 30" Welcome Mat - $29.95 - GolfersEdgeOnline.com - Best Golf Equipment On The Web! Officially licensed decorative mat. Mats are 20" x 30" and made of 100% non-woven polyester with a skid resistant foam urethane backing. These mats are also mildew and stain resistant, UV stable and machine washable. Packaged mats are rolled and shrink wrapped. Made in USA. If you have any more questions about the MLB World Series 2016 Chicago Cubs 20" x 30" Welcome Mat; do not see the model you are looking for; need custom options; or prefer to not purchase online, then please call us at (630) 656-1291.